'My Stroke of Luck' is written by Vijay Santhanam, who has also co-authored 2 books before this with Shyam Balasubramanium. 'My Stroke of Luck' is categorized in inspirational book category. This book mentions about Vijay's battle with stroke and how he helped himself recover post-stroke. Vijay worked as a Senior Manager in BP. At 41, Vijay suffered from Stroke because of which the right side of his body was paralyzed. He received enormous support in form of his guiding angel - his wife Kainaz and his friends and family. They basically made sure that he received quality treatment. Vijay's carotid artery had a clot as a result it resulted in limited supply of Oxygen to his brain. This resulted in a Stroke attack. Vijay has also mentioned the symptoms and his battle with stroke in the initial few chapters. He couldn't talk and all his body movements were restricted because of stroke. This journey of recovery was a very difficult, frustrating and rather a painful one. He had to undergo several therapies to ensure that his recovery was smooth and fine. This book also mentions about Vijay's interests and his love for Cricket and the God of Cricket - Sachin Tendulkar. His will power and his determination to get back to normalcy is worth learning. He talks about how he had to start from Alphabets and how difficult it was to get back to learning basics. He mentions about how he experimented with certain things and events to analyse his logical and analytical skills. He wrote some thesis on cricket and later on that turned out to be a book co-authored with Shyam B. Post-stroke, after some months he gets back to work and later on learns that his organization is going through a rough patch. It mentions about his various trips during those time of distress which helped him. Sachin Tendulkar served as a motivating factor in his recovery. One definitely needs to read this book. This book is a compilation of Vijay's struggle during the recovery period. His never-say-die attitude helped him in his recovery. Not everyone is rich to afford high quality treatments and such therapies that Vijay has undergone. One needs to be fit and fine to make sure that they follow a healthy life. The language used here is simple enough to easily connect with people. 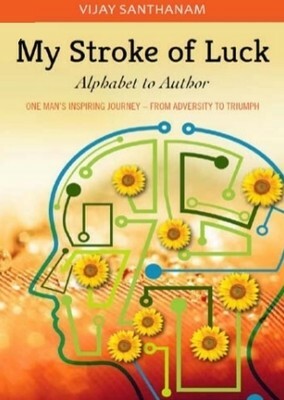 Stroke had transformed his life upside down and this book also talks about how he managed life post stroke. I have tried to keep this review short and crisp as this being a non-fiction, I wish the readers read and get inspired from this book. Never give up if you have the will power and determination to prove it. Roads would be rocky and there would be difficult times ahead and you would have to undergo serious trouble even at times when you don't expect such things. Road to recovery would be difficult and all that you need is patience. This inspiring tale of Vijay's life definitely has something that everyone should read. Vijay has also discussed about his upcoming books which would be solely written by him. 'A Stroke of Luck' - straight from Vijay's heart, his struggles to get back to a normal life. Do read and thank you Blogadda.com for this wonderful book. Do check Dr Jill Bolte Taylorts TED video of her amazing 8 years struggle to recovery post- stroke.